Part of the Utah Opioid Task Force, co-chaired by Attorney General Sean D. Reyes along with U.S. Senator Mike Lee and DEA District Agent-in-Charge Brian Besser, Utah Naloxone is a game-changer in the fight against opioids in the State of Utah. 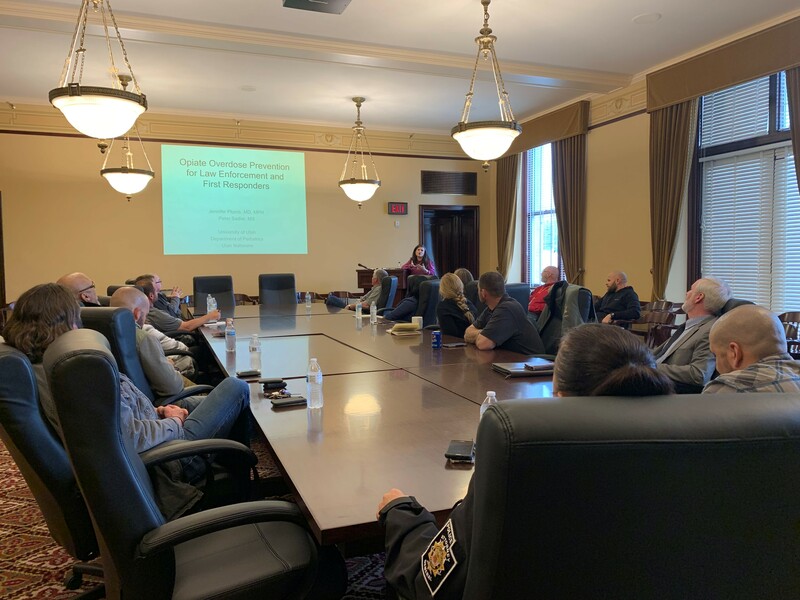 The Utah Attorney General’s office is proud of the work Utah Naloxone co-founder, Dr. Jennifer Plumb, has accomplished and is privileged to partner with her and her organization as we address the opioid epidemic in our great state. SALT LAKE CITY – More than 3,000 people in Utah have a second chance at life thanks to the efforts of Utah Naloxone. All of these individuals were given the medication naloxone (Narcan) during an opioid overdose by a non-medical layperson around them. Naloxone reverses an opioid overdose if given in time, causing the effects of the opioid to reverse and bringing them back. Opioids include pain pills, heroin, and fentanyl. Recovery (OVR) who work across the state of Utah to educate on substance use disorder, work to decrease stigma, as well as to reduce infectious disease transmission and overdose deaths. These direct community partners are a major contributor to saving lives across Utah. The number of lives saved by naloxone has been attributed as a large part of why Utah is seeing a decline in the number of opioid deaths. We were one of only seven states in 2017 where the death rate is going down. And as the number of people who are surviving an opioid overdose and making it to an emergency room for care is rising – almost doubling from 2015 to 2017 (1.5/10,000 in 2015 to 2.8/10,000 in 2017). People are saving lives and giving people a chance to survive to make it to an ER which alters outcomes for our state. There is still work to be done. Overdose is still the leading cause of injury death in the state, and Utah still is among states with a high rate of overdose deaths. If you or someone you know is taking opioids you should have Naloxone on hand in case of an overdose. Naloxone kits are available through Utah Naloxone. It is legal to possess the drug, and legal to administer it if you suspect someone is overdosing on opioids. For more information go to UtahNaloxone.org. This entry was posted in Recent Posts and tagged Narcan, opioid abuse, Opioid Epidemic, Sean D. Reyes, Utah Attorney General, Utah Attorney General's Office, Utah Naloxone, Utah Opioid Task Force on April 16, 2019 . The Utah Attorney General’s Office found itself the proud recipient of multiple Best of State awards this year. Those in the Utah AG’s office work hard to uphold the Constitution, enforce the law, and protect the interests of Utah and its people. Our sincere thanks to all those who give their time and energy to help make our office the Best of State. The Best of State Awards recognize outstanding individuals, organizations and businesses in Utah. More than 100 judges review the nominations and determine the winners based on achievement in the field of endeavor, innovation or creativity in approaches, techniques, methods or processes, and contribution to the quality of life in Utah. See below for a complete list of the AG’s Best of State 2018 awards. The Utah AGO nominated DEA District-Agent-in-Charge Brian Besser for the following award due to his relentless work in combatting the opioid epidemic that has hit Utah both in the metro and rural areas. We are privileged to call him a partner, colleague, and friend. This entry was posted in Recent Posts and tagged Best of State, SafeUT, Sean D. Reyes, Utah Attorney General, Utah Attorney General's Office, Utah Opioid Task Force, Utah@EASE, White Collar Crime Offender Registry on April 11, 2019 . On this National Vietnam War Veterans Day, we at the Office of the Utah Attorney General want to publicly thank and honor those who sacrificed so much in the Vietnam conflict and the families that stood alongside them during their service. Some of our colleagues in the AG’s Office fought in Vietnam with valor and distinction. Over three million Americans served in the Vietnam War– a long, costly, and divisive conflict – and we lost more than 58,000 men and women as a nation. Tragically, according to the Veterans Administration, some 500,000 who served suffer severe post-traumatic stress disorder. Additionally, rates of divorce, suicide, alcoholism, and drug addiction are markedly higher among Vietnam veterans. For their sacrifice, it is our responsibility to acknowledge their contributions and provide resources designed to support them in whatever way possible. Through programs like Utah@EASE, Sounds of Freedom, and our partnerships with the Department of Military & Veterans Affairs and Life’s Worth Living Foundation, we affirm our commitment to do all we can so our Vietnam veterans and their families find healing and peace. Today, Governor Gary R. Herbert joined Rep. Chris Stewart and Major General Jefferson S. Burton in honoring the men & women that served in the Vietnam War. The Wreath Ceremony took place on the western grounds of the Capitol at the Vietnam, Cambodia, and Laos Memorial. They were joined by Utah veterans and their families. This entry was posted in Recent Posts and tagged Life's Worth Living, Sean D. Reyes, Utah Attorney General, Utah@EASE, veterans, Veterans Affairs, Vietnam War on March 29, 2019 . The State of Utah Department of Commerce released the following after Utah and 48 Attorneys General signed a multi-state case with Career Corporation, a for-profit education company, who agreed to stop collecting student loans, bringing $493.7 million in debt relief to CEC students across the U.S.
SALT LAKE CITY, Utah – Francine A. Giani, Executive Director of the Department of Commerce, announced today that the Utah Division of Consumer Protection will receive settlement funds for students as the result of a 493.7M nationwide lawsuit against Career Education Corporation (CEC), a for-profit education company. In the court filing, CEC agreed to reform its recruiting and enrollment practices and forgo collecting about $493.7 million in debts owed by 179,529 students nationally, in a settlement with the Utah Division of Consumer Protection filed through the Utah Attorney General and 48 other attorneys general. “This case is a triumphant win for CEC students whose for-profit school failed to deliver on empty promises. Often these institutions prey on a vulnerable population, working parents and students who are looking find careers outside traditional college degrees. Utah hopes this case sends a message to the industry that our attorneys will actively pursue cases to defend student’s consumer rights,” stated Francine A. Giani. The Assurance of Voluntary Compliance filed January 3, 2019 caps a five-year investigation. CEC agrees to forgo any and all efforts to collect amounts owed by former students living in the states participating in the agreement. In Utah, 399 students will get relief totaling $980,547.39. Nationally, the average individual debt relief will be about $2,750. CEC has also agreed to pay $5 million to the states. Utah’s share will be $50,000 which will go to the Consumer Protection Education and Training Fund. CEC is based in Schaumburg, Ill., and currently offers primarily online courses through American InterContinental University and Colorado Technical University. CEC has closed or phased out many of its schools over the past 10 years. Its brands have included Briarcliffe College, Brooks Institute, Brown College, Harrington College of Design, International Academy of Design & Technology, Le Cordon Bleu, Missouri College, and Sanford-Brown. CEC deceived prospective students about the rate that graduates of CEC programs got a job in their field of study, thereby giving prospective students a distorted and inaccurate impression of CEC graduates’ employment outcomes. For instance, CEC inaccurately claimed that its graduates were “placed” who worked only temporarily or who were working in unrelated jobs. As a result of the unfair and deceptive practices described above, students enrolled in CEC who would not have otherwise enrolled, could not obtain professional licensure, and were saddled with substantial debts that they could not repay nor discharge. CEC denied the allegations of the attorneys general but agreed to resolve the claims through this multistate settlement. Robert McKenna, former Washington state attorney general and current partner at the San Francisco-based law firm of Orrick, Herrington & Sutcliffe, will independently monitor the company’s settlement compliance for three years and issue annual reports. Make no misrepresentations concerning accreditation, selectivity, graduation rates, placement rates, transferability of credit, financial aid, veterans’ benefits, or licensure requirements. Not enroll students in programs that do not lead to state licensure when required for employment, or that due to their lack of accreditation, will not prepare graduates for jobs in their field. For certain programs that will prepare graduates for some but not all jobs, CEC will be required to disclose such to incoming students. Provide a single-page disclosure to each student that includes: a) anticipated total direct cost; b) median debt for completers; c) programmatic cohort default rate; d) program completion rate; e) notice concerning transferability of credits; f) median earnings for completers; and g) the job placement rated. Require students before enrolling to complete an Electronic Financial Impact Platform Disclosure, which provides specific information about debt burden and expected post-graduation income. CEC is working with the states to develop this platform. Not engage in deceptive or abusive recruiting practices and record online chats and telephone calls with prospective students. CEC shall analyze these recordings to ensure compliance. CEC shall not contact students who indicate that they no longer wish to be contacted. Require incoming undergraduate students with fewer than 24 credits to complete an orientation program before their first class that covers study skills, organization, literacy, financial skills, and computer competency. During the orientation period, students may withdraw at no cost. Establish a risk-free trial period. All undergraduates who enter an online CEC program with fewer than 24 online credits shall be permitted to withdraw within 21 days of the beginning of the term without incurring any cost. All undergraduates who enter an on-ground CEC program shall be permitted to withdraw within seven days of the first day of class without incurring any cost. CEC has agreed to forgo collection of debts owed by students who either attended a CEC institution that closed before Jan. 1, 2019, or whose final day of attendance at AIU or CTU occurred on or before Dec. 31, 2013. The CEC investigation was led by Iowa, Connecticut, Illinois, Kentucky, Maryland, Oregon, and Pennsylvania. The agreement also covers the District of Columbia and the following states: Alabama, Alaska, Arizona, Arkansas, Colorado, Delaware, Florida, Georgia, Hawaii, Idaho, Indiana, Kansas, Louisiana, Maine, Massachusetts, Michigan, Minnesota, Mississippi, Missouri, Montana, Nebraska, Nevada, New Hampshire, New Jersey, New Mexico, North Carolina, North Dakota, Ohio, Oklahoma, Rhode Island, South Carolina, South Dakota, Tennessee, Texas, Utah, Vermont, Virginia, Washington, West Virginia, Wisconsin and Wyoming. This entry was posted in Recent Posts and tagged Attorney General's Office, Career Education Corporation, loans, multi-state settlement, Sean D. Reyes, Student Debt, utah department of commerce, Utah Division of Consumer Protection on January 10, 2019 . Today, Utah Attorney General Sean D. Reyes, in an effort to educate and protect the citizens of Utah, issued the following statement recognizing National Slavery & Human Trafficking Prevention Month. “Having seen the brutal effects of human trafficking in a very close and personal way, I can attest that it robs victims of innocence, dignity, and hope. It is a horrific violation of human rights and a crime of terror. Every Utahn – every American – must understand that human trafficking can be found in any community — rural or urban, wealthy or modest, religious or secular. It does not discriminate in its victimization of people of all backgrounds. “The eradication of human trafficking should be a priority for all who value justice, virtue and freedom. The fight to end human trafficking transcends political and ideological differences. It is not a Democrat or Republican issue but a humanitarian one. As such, it is critical for Utah and all states to work even more closely with law enforcement, first responders, and the communities who come in contact with human trafficking victims to combat modern-day slavery. Stay tuned over the next few weeks. 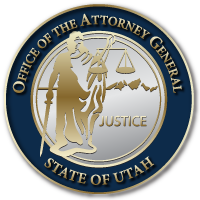 The Utah Attorney General’s Office will publish a short series of human trafficking articles – how to recognize trafficking, how to report, and detailing elements of this $150 billion worldwide industry. Thank you for paying attention. This entry was posted in Recent Posts and tagged Human Trafficking, January 2019, Sean D. Reyes, Slavery, Slavery & Human Trafficking Month, Utah Attorney General on January 9, 2019 . The start of a new year is always a hopeful time, as we give thanks for the end of one year and celebrate the beginning of another. May better and brighter days lay ahead and may you have the courage and determination to rise up and meet whatever comes your way. On behalf of Utah Attorney General Sean D. Reyes and the Office of the Utah Attorney General – Happy New Year! This entry was posted in Recent Posts and tagged 2019, Happy New Year, Sean D. Reyes, Utah Attorney General on January 1, 2019 . On behalf of Utah Attorney General Sean D. Reyes and the Office of the Utah Attorney General – Happy holidays! This entry was posted in Recent Posts and tagged Happy Holidays, Merry Christmas, Sean D. Reyes, Utah Attorney General on December 25, 2018 . This is a big win for the Trump Administration, for justice reform leaders like our own Senator Mike Lee, and most importantly, for the American people. Allowing more discretion in sentencing empowers judges and the system to personalize the punishment to the crime. Giving inmates who meet strict criteria a chance at redemption and an opportunity to become productive citizens benefits all of us. Not only does it reduce an overcrowded prison population, it provides a workforce eager to contribute to society. I’ve been honored to work over the past year with the White House, Senator Lee and other leaders to get this bill passed. As a former co-chair of the Civil Rights Committee for the National Association of Attorneys General, and in various positions over a decade before that, I have advocated for reform to our criminal justice system; a system that disproportionately affects minority communities and inflexibly captures certain individuals who may not deserve to be there in the first place. Again, I applaud the U.S. Senate’s approval of the historic ’First Step Act.’ But this legislation is just that – a first step. I will continue my work with Utah leaders and attorneys general from other states to expand reform beyond just the federal system in order to reduce recidivism, save taxpayer dollars, provide treatment for mental health and substance abuse and providing some nonviolent offenders a second chance. We can find these humane and balanced solutions while still aggressively protecting Utahns from violent crime and keeping our communities safe. The bi-partisan political support for this bill along with diverse buy-in from groups such as law enforcement, civil rights leaders and academics speaks to the need for such reform. This entry was posted in Recent Posts and tagged NAAG, National Association of Attorneys General, Sean D. Reyes, Senator Mike Lee, The First Step Act, U.S. Senate, Utah Attorney General on December 18, 2018 .